It’s been a bit more than 10 years now since the release of the documentary “An Inconvenient Truth,” in which Al Gore warned that “within the decade there will be no more snows of Kilimanjaro” as a result of man-caused global warming. As with many of Mr. Gore’s warnings, that was a convenient fiction. Kilimanjaro’s current glaciers began forming almost 12 thousand years ago as the last glacial period ended and the climate of equatorial Africa became wetter and warmer. The ice fields have expanded and receded many times since then, and began their current recession in the mid-1800’s, at the end of the Little Ice Age. They have receded more than 85% since their extent was first measured in 1912. 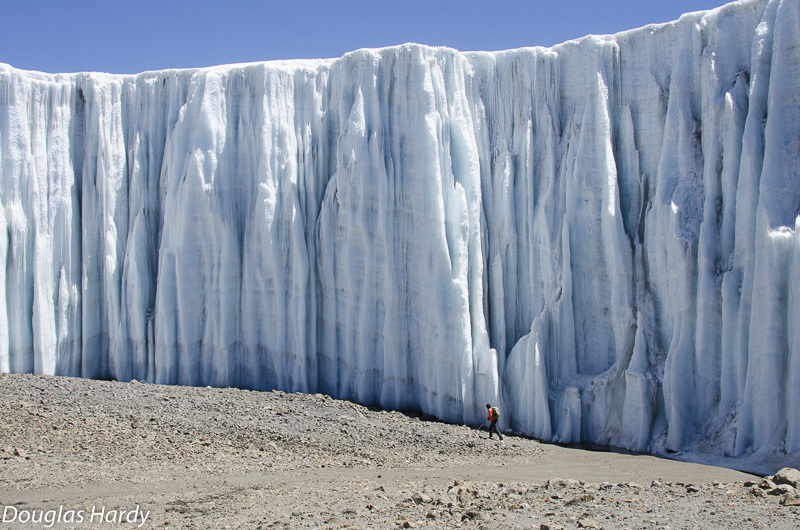 However, Kilimanjaro can still receive more than 4 feet of seasonal snowfall, and the remaining ice cap is still as much as 170 feet thick. The air temperature at 19,000 feet does not rise above freezing. The snow and ice rarely melt, they evaporate due to low relative humidity for which man-caused global warming is not the primary cause. In the mid 1800s, a change in the trade winds reduced snowfall. As population increased, cutting of forests around the mountain’s base reduced humidity and rainfall. Reforestation is apparently increasing precipitation, but it may take a change in the trade winds to reverse the loss of ice at the summit. If and when that might occur is unknown. Al Gore’s “expert” source for his warning was paleoclimatologist Dr. Lonnie Thompson. Dr. Thompson gained fame and fortune through scientific research suggesting man-made climate change is a global crisis, garnering more than $10 million in government grants and a shelf full of environmental awards from his prodigious efforts. No matter if his predictions don’t pan out so long as the initial media coverage is alarming. While climate crisis promoters profit from their alarming prognostications, volunteers have been busy planting trees around Kilimanjaro. It’s not clear their efforts can succeed long term. Population in the area has more than tripled in the last 50 years, and most of it relies on firewood and charcoal for cooking and heating. But if deforestation isn’t reversed, the population faces an unpleasant future as farmland erodes and water supplies dry up. Once he’d attributed Kilimanjaro’s ice loss to anthropogenic global warming, Dr. Thompson moved on. However, his research partner, Douglas Hardy, is still working on the mountain and reporting online at http://kiboice.blogspot.com/. For those who want to contribute to the reforestation effort, I found only two groups that are actually claiming results, and both are Christian outreach programs. Plant With Purpose, a non-profit with a good review from Charity Navigator, does reforestation and ecological education in Haiti, Mexico, the Dominican Republic, Thailand, Burundi, and Tanzania. Their website is at https://www.plantwithpurpose.org/. Trees 4 Kilimanjaro, unrated, claims planting of 75,000 trees. Their website is at http://www.trees4kili.org/. Neither reference constitutes an endorsement. Could the presidential election determine the fate of the Upper Verde River? The “Project for A New American Century” (PNAC) was a neoconservative think tank co-founded in 1997 by Robert Kagan and William Kristol. In February 1998, PNAC members produced an open letter to President Clinton advocating regime change in Iraq due to Saddam Hussein’s persistent non-compliance with U.N. mandates. In October 1998, Congress passed the “Iraq Liberation Act” stating that “it should be the policy of the United States to support efforts to remove the regime headed by Saddam Hussein from power in Iraq.” President Clinton signed the bill and two months later pulled weapons inspectors out of Iraq and initiated a 4-day bombing campaign. But without public support, that is as far as Iraqi “liberation” got — until the 9/11/2001 attack on the U.S. provided an opportunity. Deputy Secretary of Defense and PNAC member Paul Wolfowitz advocated using the 9/11 attack as an excuse to invade Iraq, and President Bush enthusiastically agreed. PNAC member Richard Perle, Wolfowitz, and others hit the Sunday morning news shows promoting an invasion, which Congress effectively green-lighted in October 2002. And so the blame for the Iraq invasion was placed on Bush and the neocons. But before there was a PNAC, there was the Democratic Leadership Council (DLC). The DLC, founded in 1985 (and chaired by Bill Clinton from 1990-1991) also endorsed the invasion of Iraq after 9/11, and supported many Bush policies. In fact, much of the DLC philosophy is no different from the PNAC neocons’. As senator, Hillary Clinton was a prominent DLC member. She and other congressional DLC members gave Bush the authority to invade Iraq. They did not do it because they were “fooled,” and it’s no surprise that the Bushes, Kagan, Perle, and Wolfowitz favor Clinton over Trump or Johnson in the 2016 election. Neocons and neolibs are unapologetic corporatists. Clinton has not raised more than $500 million in political donations by favoring “plain folk.” She travels on a Boeing 737 jetliner with a custom paint job. She netted more than $3 million in one day’s fundraising at the Martha’s Vineyard estates of Lady de Rothschild and former Universal Studios CEO Frank Biondi, events that were interspersed with a 20-mile flight to a fundraiser at the Nantucket Island estate of the former Portugese ambassador. There is, however, one campaign pledge that could come to fruition: the costly escalation of the government’s war on climate. Which brings us to the Verde River. Investments in two proposed energy projects in the Upper Verde Watershed depend on federal subsidies. NextEra Energy has proposed the largest wind farm in Arizona on leased Yavapai Ranch land. Longview Energy Exchange has proposed a $4 billion pumped storage plant over the Big Chino Aquifer. The wind farm has yet to be added to the Yavapai Ranch development plan submitted to the county. The pumped storage plant’s preliminary permit was extended by Federal Energy Regulatory Commission until April 2017. Given sufficient tax credits, taxpayer guaranteed loans, and government-mandated pricing to ensure investor profits, these two projects could help justify each other’s construction, forcing taxpayers and ratepayers to foot the bill for inefficient storage of inefficiently produced electricity. After an immediate pump out of 17,500 acre-feet of water to fill the storage reservoirs, evaporative water losses would require additional pumping, especially when aquifer recharge would be at a minimum. It’s hard to imagine how this would not reduce outflow from the aquifer into the already depleted Upper Verde. Bad as that sounds, it could be even worse. Back in 2008, Texas billionaire T. Boone Pickens proposed using eminent domain to open a corridor for transmission lines from the panhandle to Dallas, where he could sell electricity generated by his tax-subsidized wind farms. He also wanted that corridor for a more profitable business. Once the corridor was open, pipe could be laid to sell water pumped from the Ogallala aquifer under Pickens’ property. Public outcry put an end to that project, and Pickens wound up selling his water rights to local governments and quitting the wind power business. The so-called “Pickens Plan” can be imagined here. NextEra builds the wind farm, Longview builds the pumped storage plant. One transmission line connects the two projects, another connects Longview to APS’s 230KV line at Willow Lake. The right-of-way to Willow Lake could then be used to pipe Prescott’s water allotment from the Big Chino.